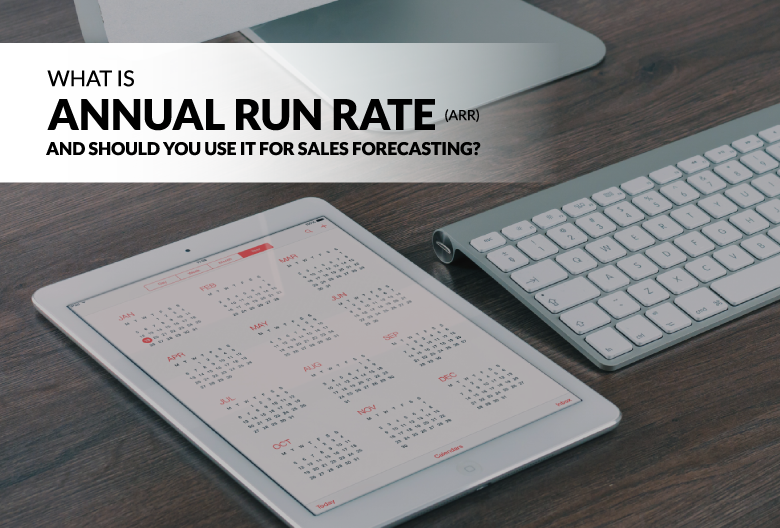 What is Annual Run Rate (ARR) and Should You Use it for Sales Forecasting? When it comes to predicting sales revenue, the simplest method is not necessarily the best. A quick estimate can make due in a pinch, but it’s up to you to decide whether it’s worth factoring it into your sales forecasting. Today, we’re going to talk all about annual run rate (ARR): what it is, how to calculate it, and why it’s not the most accurate way to forecast your sales revenue. Annual run rate is a method of forecasting annual earnings based on revenue from a shorter period (typically the current month or quarter). Though it’s a quick and easy way to predict revenue for the year, many consider ARR to be overly simplistic and don’t rely on it for accurate forecasts. That said, ARR can help business owners project annual earnings when there isn’t much other data available, which can be helpful for marketing and pitching to investors in the early days of running a startup. Annual run rate is calculated by multiplying monthly or quarterly earnings into an annual figure. For instance, you could tally up sales from a specific month or quarter and use this to extrapolate a projected annual revenue. Let’s say a SaaS startup made $20,000 in revenue for the month of June. To get their annual run rate, they would simply multiply their earnings by twelve. 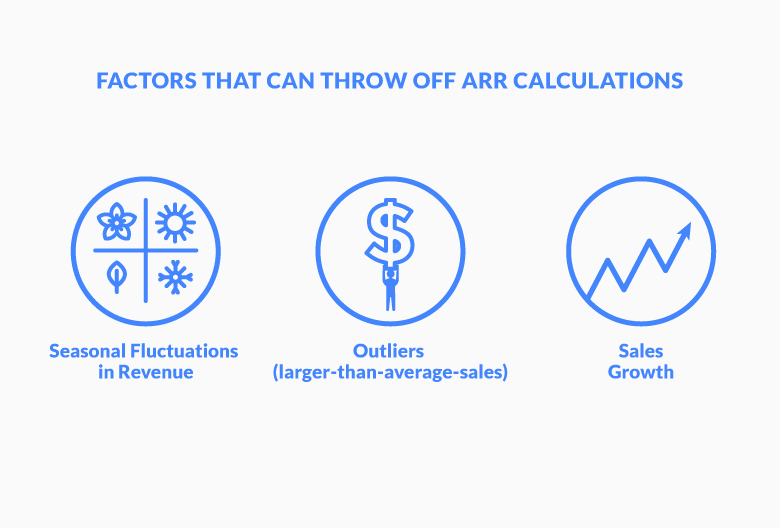 Unfortunately, using ARR to forecast revenue often leads to more problems than solutions. If the month or quarter used to calculate your ARR is higher or lower than typical, your results will be distorted. Plus, ARR doesn’t account for the churn or growth most startups experience over the course of a year. Since ARR can vary greatly depending on which period you choose to input into your calculation, it’s also an easy metric to manipulate. For example, plugging in revenue from an unusually profitable month will give you an overly optimistic forecast, which can throw off your budget, mislead stakeholders, and create unrealistic expectations for everyone on your team. Here’s a quick example. The SaaS startup we mentioned above used their June revenue to calculate ARR – but what if they used their numbers from May instead? Or if they calculated ARR using quarterly revenue instead of monthly? If they had $15,000 in revenue in May and input that figure into their calculation, their projected annual revenue would $180,000 – which is $60,000 lower than their ARR based on sales in June! But which one of these calculations is more accurate? Whether or not they’re accurate isn’t exactly relevant, since we can already see the massive discrepancy between the two forecasts – which means neither one is reliable. The volatile nature of monthly revenue makes it dangerous to predict annual revenue based on a single month. Now, for curiosity’s sake, here’s at a hypothetical breakdown of the startup’s monthly revenue for the year. 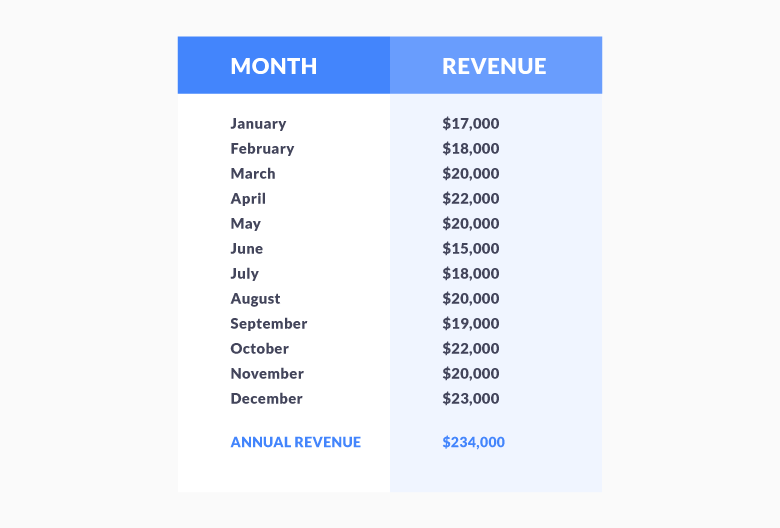 In this example, the average monthly revenue is $19,500, which isn’t a perfect match for any of their actual monthly revenue. Now, if the startup used their quarterly revenue to calculate ARR, they get a different number again. For instance, at the end of June they might use their Q2 revenue to forecast $228,000 revenue for the year. This is a slightly more accurate method, since it takes a wider sample size into consideration, but it still doesn’t account for all potential variables. Though the calculation is overly simplistic, it can be useful in some cases – but only if you avoid these forecasting mistakes. Businesses that see an increase in sales during certain seasons should avoid calculating their run rate over these periods. If you calculate your run rate during the busiest time of year, your forecast will be overstated; calculating your run rate during a slump will result in an understated estimate. If you typically sell to small clients and recently landed a major account that boosted your monthly revenue – nice work! However, you should exclude larger-than-average contracts and one-off sales from your ARR calculation. Including these outliers can skew your results even further. It can be tricky to take sales growth into account when calculating annual run rate. Startups, in particular, are likely to experience hikes in revenue as the business develops, but annualizing revenue based on a single month or quarter fails to adjust for this. So, is Annual Run Rate Worth Calculating for Your Business? Some new startups find value in ARR, since it allows them to predict future earnings before they have previous years to compare it to. However, it’s not a great option for SaaS companies that are likely to experience negative earnings during their first few months of operation. Unfortunately, in most cases, ARR doesn’t allow for reliable forecasting. There are too many additional factors that it doesn’t take into consideration. So, what’s the best option? We recommend looking at your monthly recurring revenue (MRR) for more accurate forecasting. Whether you’re a growing startup or established SaaS business, a CRM tool like Propeller can help increase your revenue. Start your free trial today to find out how our platform makes it easier for you to generate new leads through cold email, keep track of customer details, and streamline your sales process.